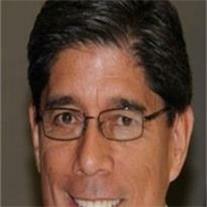 Cadiente, Ronald, 61, died in a mountain bike accident February 11, 2012. He is survived by his wife Pamela, children Garron (Sharon) Cadiente, Brett Cadiente, Maren (Jimmy) Bloomer, Brooke Cadiente, Paige (Sterling) Stahle, 13 grandchildren and brothers Herb Davis, Carlos Cadiente and Rick Cadiente. A kind and loving husband, father and grandfather he was devoted to his family whom he loved unconditionally and enjoyed being involved their lives. He was passionate about the work he did as a software salesman and valued the relationships he made. He was honest, hardworking, sincere, and compassionate. Ron was a baseball coach, avid hiker, mountain biker, University of Arizona graduate and family man who was as generous in his relationships as he was genuine. As a member of the Church of Jesus Christ of Latter-day Saints, he served a mission in southern California and served in a variety of church leadership positions, including Bishop, all of which he loved. He was an influence for good in every aspect of his life. He is missed and loved by many, especially his family. Viewing is February 16th from 6-8 PM at Bunker’s Garden Chapel, 33 North Centennial Way, Mesa AZ 85201. Funeral is February 17th, 11 AM with viewing one hour prior at the LDS Church, 1430 N Grand Street, Mesa AZ 85201.